Confirming that your potential customers are looking for a solution to a problem also known as a “problem/solution fit”. Making sure that your potential customers want your product in particular and not just a solution in general or “product/market fit”. Developing a growth strategy for the product. The second stage of development — finding a product/market fit — is what I will talk about in detail. Product/Market fit is one of those buzzwords that can be difficult to define. But in fact it’s a very simple concept: create a service or a product that people really want. Product/ Market fit is often described as a stage at which your product is wanted on the market enough to allow for efficient and constant growth. The tricky thing about achieving product/market fit is that it is often difficult to quantify “fit.” There’s isn’t a particular milestone after which your product is bound to succeed. We talked more specifically about finding a market opportunity for your product in our article about building mobile startups that make money. Thankfully, a template called Product/Market fit Canvas was has been designed specifically to help you evaluate the product/market fit for your app. Product/Market fit Canvas helps you find out who your customers are and what you can do to connect with them and meet their expectations. The template is divided into two segments: a customer segment and a product segment. The customer segment helps you with an initial analysis of your app’s target audience. The product segment helps with analysis after the launch, when you evaluate how your app fits into the overall market. When is the best time to analyse whether your product has the right product/market fit? In short, there are two best times. You should analyse product/market fit both at the pre-launch stage as well as at the beta testing stage. The pre-launch stage is when you define your market and your target audience. The launch/ Beta-testing stage is when you analyse your minimum viable product (MVP) to see how it fits in the market and what you should do to improve it. Who are your target clients? How can you define them and group them? What are the problems that they want to solve by using your service or product? How do they plan to use your product or service? What do your customers get by using your product or service? Analyzing all aspects of customer/product interactions will help you to see what you product’s selling point is and what your competitive advantage is. Millennials. iPhone users. Frequent travellers. Want to keep in touch 24/7. Want to share photos/video. Now it’s time for the beta-launch stage. You have a minimum viable product. It’s out on the market and it gives you the opportunity to analyze your app’s features and see how you might improve the core functionality. Find out who your app’s main competitor is and what can be improved in your core functionality to make your app better than that competitor. Think about possible improvements this way: every characteristic of your product should fulfill a need or tackle a specific aspect of a problem your customers have. Real-time Messenger. Photo/video sharing features. A real-time messaging solution that lets people share photos and videos with their friends. send photos and videos to individual friends or to groups of friends. Once you’re finished with the template you’ll have a much better understanding of where you product fits in the market and how strong the demand is, and you will be able to avoid costly mistakes that happen when you overestimate the initial demand for a product. Product/Market Fit Canvas is a simple tool that lets you concentrate on core features of your MVP and highlight strengths and weaknesses, which is essential at the initial stages of app development. 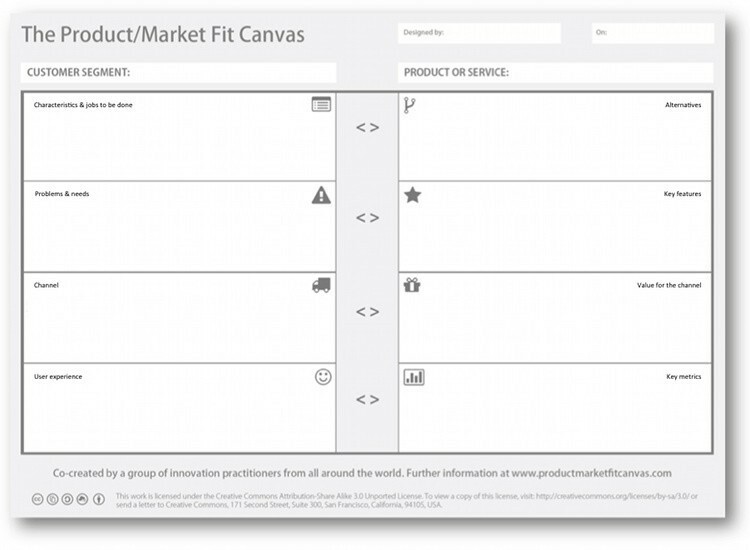 The Product Market Fit Canvas lets you focus on the unique solution your product offers. 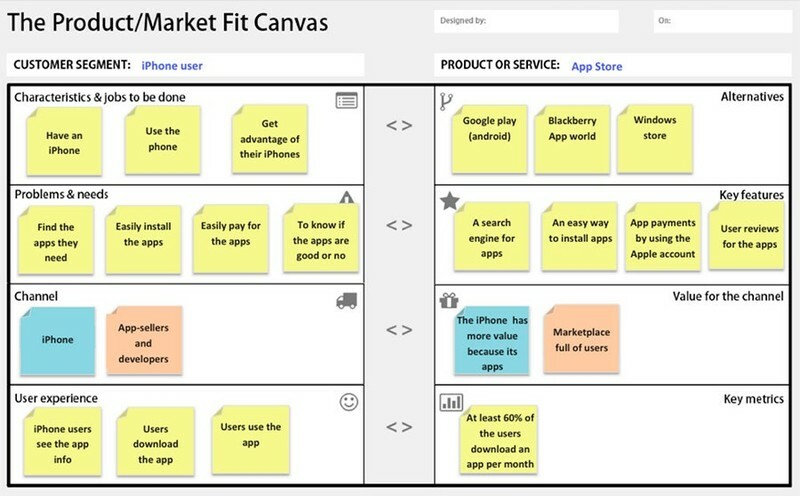 The Product Market Fit Canvas helps you come up with a number of business opportunities and evaluate if they might succeed on the real market. The Product Market Fit Canvas guides your product from a raw concept to a real business opportunity that can be tested on the market. The Product Market Fit Canvas helps you identify metrics that are the most important for the development of your product and analyze how well your product satisfies customer needs. Achieving product/market fit generally means that your startup is ready to meet the challenges of the market. But how do you know when it’s time to evaluate you app’s product/market fit and how can you do that? We did some digging for you and chose three things that — if all of them are present at the same time — will likely mean that your app has achieved product/market fit. If within a three-month to nine-month period after your app’s release you have acquired as many users as you planned (or have approached the desired number), then you have achieved product/market fit. Your product satisfies the existing demand on the market and is searchable within app stores. How many users should you plan to acquire? It is often difficult to provide an exact number that will be meaningful for your app. Learning about your target audience requires thorough market research and takes time. You must learn about existing competition and analyze the size of the market that is available for your app at the initial stages of its life. When you know how many users your direct competitors have, you will have an approximate number that your business has to exceed if you want your app to be successful. If at least 30 to 40 percent of people who installed your app are actively using it, then you have achieved product/market fit. A ratio of roughly 1:3, or one active user out of every three who have downloaded the app, is generally seen by market researchers as good for apps with around 100,000 total users. A 1:3 ration means that the app as a product is mature enough to meet the main requirements of the user. It also means that your MVP model was well thought-through and, as a result, that your app presents the most necessary and attractive features that people are looking for. If at least half of all users use your app according to a consistent and repeatable pattern — that is, they use the app in a similar way and aim for similar results — then you have achieved product/market fit. If you discover that people are using your product — but not in the way you intended them too, then beware: it might be a sign that you did not develop your app with a specific problem in mind. If users’ patterns of behaviour differ greatly one from the next, then you might want to reconsider your app concept. Sometimes it is necessary to cut out several features in order to highlight the true purpose of your product. Why do you need to learn about Product/Market fit at the very beginning of the app development process? Knowing how to achieve product/market fit will provide you with a solid understanding of the direction your product should be moving in. Knowing how well your app fits into the market you are targeting will help you iterate and adjust according to the needs of your target audience. Finding the right product/market fit for your app is the first step that you as a product owner should take when developing a mobile app.